Get ready for the theme announcement tomorrow! Go back to my three points above. Each of them are equally important, but your implementation might look different than someone else’s. My friend Scot from Cuberules.com (if you are in Corporate America you need to subscribe to his blog) wrote about my layoff. I admire Scot a lot because he has the career that I always wanted… he did (and still does) the corporate gig very well. But, what I like about Scot so much is that he isn’t blinded, pollyanna-style, by the promise of Corporate America. He’s very pragmatic about career management. We need more pragmatic thinking about career management! And companies WANT us to be invested in the work because almost every pundit out there will tell you employee engagement is critical to the success of the company. Please go read Scot’s post. I’m not writing this to disparage my former employer. Lots of good came out of that 9+ month gig. But what I learned is that even the best companies, even the dream job, can end so fast your head is spinning. I was fortunate in that I have developed multiple income streams. No, it wasn’t easy. No, this wasn’t done overnight. But I have no regrets building those income streams over the years. They sure came in handy on November 30th. I talk to a lot of job seekers. I talk to a lot of coaches. Over the years I’ve had coaches say “if I tell my clients about JibberJobber they might waste their time on it, like they do on Facebook and LinkedIn!” I help them understand that JibberJobber isn’t a social network, so you won’t get lost looking at cat memes. But their point was made, loud and clear. Coaches are concerned that job seekers are wasting their time. It’s easier to do some honey-do tasks than it is to go to a networking meeting. It’s easier to revise your resume again than it is to get or go to an informational interview. The things on the left are low-return, the things on the right are high-return. The things on the left are more comfortable, and easier to do. They are also what I call hiding. Check out this post I wrote in 2012 called Stop hiding and actually start your job search. It was the lowest, most demoralizing time in my job search back in 2006. This time, when I was about sure I was going to get a job offer, I kept looking. I kept doing the normal job search stuff. It was hard, for sure, because I was so excited about that job being The One… but I knew that if they chose someone else I didn’t want to be devastated. So I kept looking, just in case. If I got a bad email, I would know that I still had options. You keep looking, no matter how close you are, so that you continue to have options. Thirteen years ago, when I was sure I had an offer coming, I stopped looking. Later, I needed to start over, almost from scratch. This principle applies in other places. I have a friend who works on projects… he messages me when he completes one and submits it for billing. He wants to celebrate a bit. I tell him congrats, and then tell him to move to the NEXT proposal. Keep looking, keep working. They all add up. I’ve known people who have companies that were in talks to be acquired… I tell them to get ANOTHER suitor. Having ONE puts them in a position of power. Having more than one puts YOU in a position of power. Keep looking, keep looking. The reason can be summed up with that old expression, don’t count your eggs before they hatch. First, and I think the most important bit of advice, is to work on your soft skills. I was not the only one surprised by the results of Google’s study of what made their top workers so successful, where the FIRST seven of ten things were soft skills. Isn’t that mind-boggling? The top seven most important characteristics of successful Google employees do not include technology skills! I’m still shocked. But I’m not surprised. Soft skills are so critical in today’s world, especially where there is a certain assumption of technical abilities. I have 30 (and counting) Pluralsight courses that you can access that will help you with soft skills. You can see my soft skills courses on Pluralsight here. While the primary audience of Pluralsight has been programmers, my soft skill courses are applicable to anyone. Want to become a better listener? Want to learn about leadership, management, even career management (of course)? I have that, and more. I can offer you a 30 day pass on Pluralsight. Just get a JibberJobber account and then use the contact us to ask for more information. My main point is, for your career growth, work on your soft skills! When you help others, whether you need help as a desperate job seeker or you are totally comfortable in your day job, you are creating great value in your network. I told the author of the dice article about an opportunity that I had… what would have been a sure job offer through the brother of a close friend. It would have been awesome. I was at a networking event a few days earlier and met someone who would have been the perfect hire. In my conversation with the hiring manager I said that I’d be happy to pursue this, but they really should have the other guy come in, too. Long story short: the other guy was offered the job. And I felt awesome, for the small part I had in his success. Helping others can be as dramatic as that, or it can be as simple as saying “yes, I would be happy to meet with you for 30 minutes.” Helping others means you make introductions, or make calls on behalf of the other person. It means you remember someone’s name, or just greet someone kindly. It means you speak kindly of others. There are hundreds of ways you can help others…. I hope that this can be a career goal for you in 2019 and for years to come. Third, do The Thing you know you need to do. When the writer of that article asked me (in an email) what every technology professional should have as a career resolution in 2019, the first and second things mentioned above came to mind first. As we were talking, I had another idea. It’s hard to say “all technologists should do this.” We’re talking about tens of millions, hundreds of millions of people. My idea was the one at the bottom of the article, the one where I was cited. It was that you already know what you should do. There is, I’m sure, at least one thing that you should work on. I’m not sure if it’s to get better at a certain hard skill, or to expand your network, or to get ready for a a leadership role or to branch out as an entrepreneur… I don’t know. But I bet you know. So my suggestion is to work on the thing that you know to do. I don’t have a silver bullet answer for you… you already have the answer. I was under a pavillion at a campground and there were about 100 people milling around getting ready to leave. They were in various stages if breaking camp. I was watching someone who took the initiative to load the trailer we had brought… there were coolers, sleeping pads and bags, backpacks an duffel bags, camp stoves… all the usual stuff you’d expect to see there. There was were also a couple of queen mattresses. Not the normal camping gear, but hey, when I camp on my back porch with my kids I love to bring up a mattress instead of use a little camping pad. Who am I to judge someone who brings a queen mattress to a long camp out? The reason I’m sharing this is because you have a list of things to do today. Think of “today” as your trailer, and the “list of things” as camping supplies. You have to fit your “list of things” into “today,” right? I’ll tell you what your queen mattress is right now: it is reaching out to humans. Calling them, emailing them. Not in a group or list, but individuals. A lot of the job seekers I talk to would rather send mass emails or group messages than reach out to a single person and ask for a call, meeting, or meal. But that, my friends, is networking. We need to make individual connections and have conversations with individuals. You can do all kinds of other things in your job search… look for job openings on job boards, polish this resume, work on that cover letter, do research on LinkedIn, even poke around JibberJobber looking at stuff… those are not necessarily bad things. But if you spend all of your time doing that, you’ll fill the trailer and still have the big mattresses left… which means you’ll have wasted time and energy. Get the big mattresses in first… MAKE THE CALLS, every single day, to individuals. Once you have done that, then you do the other stuff (try and do it by order of importance). Over the years I’ve written a lot about this topic. Here’s one of my favorite posts: Stop hiding and actually start your job search. The thing that just galls me about the layoff piece is this: good people take on personal energy to put into their job. They get invested in it because it aligns with what they want to be doing (passion or not). And companies and their management want us invested in what they are doing, where they are going. And then the management changes direction. Executives have their contracts and parachutes; we’re lucky if we get severance. The dissonance between “our people are our most important asset” and “your last day is November 30th” is just tough to reconcile. But the disillusionment of being invested in the plan, the goal, the work and then having it taken away has a particularly bad impact on our egos and self worth. I’ve become highly cynical about Corporate America, for good reason. I look at corporate pronouncements with a detached, highly cynical eye (the one today was along the lines of “we’ve now completed our simplification of [company name removed] as we have now sold off x, x, and y”). I don’t buy into any direction the company provides, outside of what’s in it for me and recalculating my quarterly “how long will my job last” questionnaire. It’s not team oriented at all, although I help my team. It’s highly narcissistic, even though I am not. My goal is to be highly employable, knowing job security doesn’t exist. You don’t get highly employable unless you are ruthless in how you handle your career and pay attention to what is happening at work. It has saved my bacon more than once. Don’t know a way around that, though I wish I did. Be well, my friend. Fight the good fight. This comes from someone I really respect, who understands careers in corporate in a way I could only imagine. Years ago I was talking to a SVP of People (a high level HR person) who was complaining that employees just aren’t loyal to companies anymore. I couldn’t believe that this person, who I’m sure based on her tenure and title, had at some points in her career been involved in terminating whole groups of people, could even think that we are a bunch lemurs who are clamoring to work at companies and give 110% loyalty, even though with a click of a mouse we could be in the poor house, with our careers devastated. Okay, maybe that’s too heavy on the assumptions, but to hear an HR professional complain that loyalty towards a company is a thing of the past was indeed shocking. Who created this mess? If we, employees, didn’t have to worry about our livelihood, how much more productive would we be? You wouldn’t have to do employee satisfaction and engagement initiatives all the time if were didn’t have this dark cloud of BEING POOR over our heads. I’m not saying that we are entitled to wealth just because we have a job, but the unknown that comes from living in an “at-will” environment is taxing. It makes us wonder. And not matter how “great” you are, according to the “best places to work” surveys, if a better opportunity comes along in a company that hasn’t bought that designation, I might just take it. Because YOU created this environment that helps me know that YOU do not care about me or my future. HR does not care. Management does not care. When it comes down to it, a decrease in employee loyalty has come because you eliminated any loyalty towards the employee. And now we are left to fend for ourselves. That’s okay, I guess. It is, as they say, what it is. But don’t come complaining to me that employees aren’t loyal anymore. Granted, I’ve never owned a barn. Nor have I ever harvested hay. So I’m not sure what losing it all to a barn fire feels like. But I can imagine. I can imagine the work and investment it took to plant and cultivate 150 tons of hay. The hope and anticipation… what does 150 tons of hay mean for your family? For your future? The work of harvesting the hay and stacking it neatly in the barn. A job that could be dangerous and take more hours than I can imagine. The work. The investment. The hope. The vision. The chance to make a difference. All of it goes up because of a barn fire. How did it start? Could something like this ever be 100% prevented? Every part of the vision I had for my job, my contribution to the company and to the customers, just got set on fire. I was and am upset for a host of reasons. 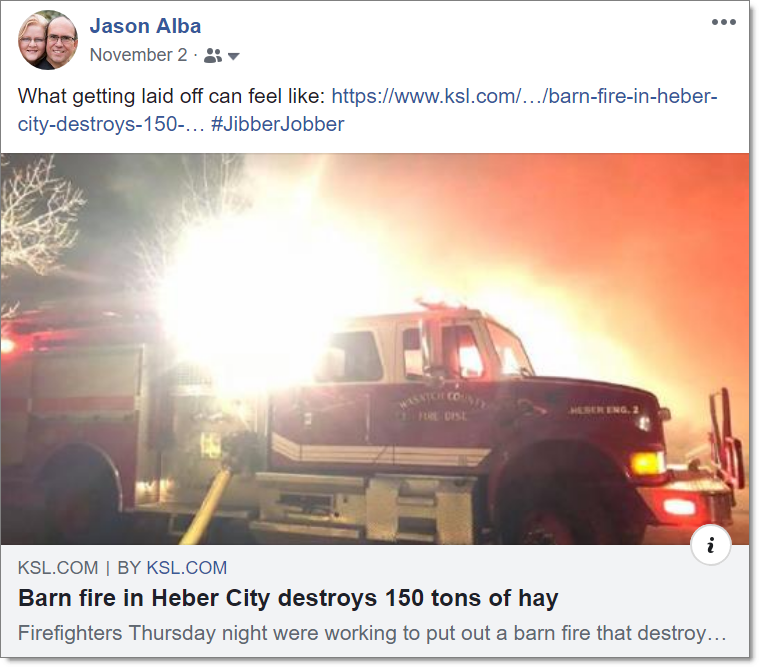 But back to the barn fire… I put a lot of work into my job. Since February, I caught my boss’s vision, and we worked hard all the way until he left to move towards the vision. And then, the fire came and burned it all down. But what really hurt was when my vision was burned. I wasn’t going to be able to change the world, in that way, with that opportunity, anymore. And that was one of the most painful parts of this layoff. I’ll let you in on a little secret. Maybe a few secrets. I’ve owned my own business for almost thirteen years now. I’m what they call an entrepreneur. I’m living the dream. I get to work when I want and do what I want. No, I’m not financially independent… but for many years I have not commuted and worked in an office, I haven’t had to ask for vacation leave, I have been able to stop working with people I didn’t like, and I could choose to focus on the part of my business that made the most sense at the time. I didn’t know what I had to offer. I didn’t know what skills or abilities I could bring to the table. Without hesitating he said I am clearly a product manager. Oooooh, I like that. Product manager. It is what I’ve done for about twenty years now. I do indeed love all things product management. So I made a product manager resume and put it out. I’m sure of what I’ve done, and what I can do, but when I put my resume out I found that hiring managers in software companies don’t care one bit about entrepreneurs who do product management. We are square pegs, they are round holes. They look at us with pity, maybe disgust, wondering what we could possibly add to their team. Maybe they are afraid of the entrepreneurial attitude. Maybe we are too out-of-the-box thinking for them. Maybe we are better suited for their job than for a lowly product manager role. I’m not sure why, but the discrimination I’ve felt as a do-it-yourself, self-taught product manager was tangible. In one interview the guy said “tell me something. Every product manager here wants to start their own side hustle, and leave their position. You have a side hustle, why would you want to come here as a product manager?” It wasn’t a regular interview question…. he was sincerely asking why in the world I would want to stop living the dream and go into corporate America. It seemed backwards to him. Another, a VP of product, just couldn’t get past the idea that I owned JibberJobber. He was sure that I would not do my the job, but would do JibberJobber all day long while on his dime. I assured him that no, I would do the job and keep JibberJobber to my own personal time, but he just didn’t buy it. I’m not sure why. I didn’t really know what I had to offer in the first place. And then, when I got these kinds of reactions in interviews I really wondered if I could actually do anything professionally. I have written three books. I’ve authored 30 Pluralsight courses. I’ve created and maintained JibberJobber, which is really quite amazing. I have spoken across the U.S. and in Europe. I have an MBA and a CIS degree. I speak Spanish and English. I used to program and have lost any current skills, but I can do html-ish stuff fine. I have been general manager and sat on a (hostile) board of directors. There’s more of course, but looking back on any of these things, how could I possibly have any doubt that I could do this job, or that job, or another job? Any of those things can be broken down into a set of skills and talents… I’m not lacking skills or talents. Am I good for anything? In January of this year my new boss reached out his hand and brought me into a “best companies to work for” company. It was amazing. He saw me. He say my value. He valued it. And he taught me to see my value and value it. I think that human nature is not understanding who we are and how great we are (or can be). It’s easier to see that in others, but hard to see in ourselves. Especially when the job search goes on. Especially when you get rejection after rejection. Or you continually get a third interview, but they pass on you and go with the other person. How many times can you play second chair and not get a complex about yourself? Self-doubt is no fun. It is not productive. It puts you in a place that is not good for your networking or interviewing or just getting out of bed and continuing to fight the fight. I don’t know how to solve your self-doubt issues. For me, I had to do stuff. I had to write another book, author another course, build more stuff in JibberJobber, get another speaking gig. I had to rack up virtual points to validate myself. Not because I needed the ego stroke, but because I needed to chip away the self-talk (and the silence in the job search, which was almost as bad), and prove that YES, I could do things. YES, I did have value. YES, I should be on your team. Fight this battle because you deserve it for you. And your loved ones deserve a you that isn’t losing this battle. I know you have value. I know you can do stuff. Now, prove it to yourself!